Thanksgiving has passed and we are so blessed to be able to give thanks to God for another amazing year of ministry in the High Desert. 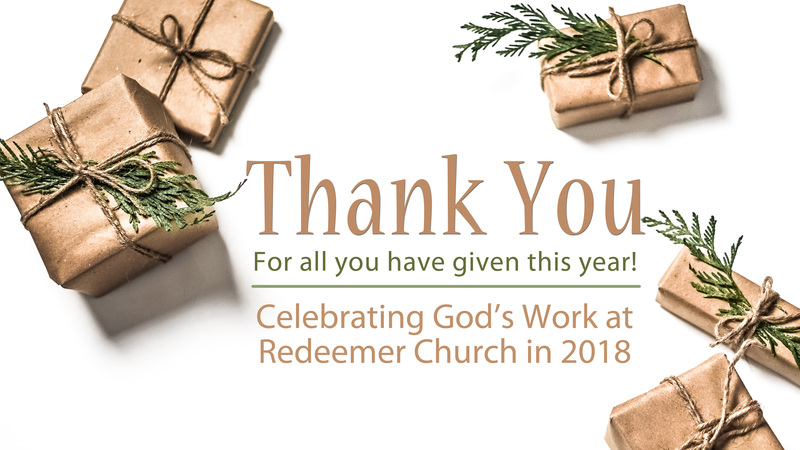 With Christmas right around the corner and a new year upon us, we want to take a moment and thank each and every one of you and your contributions to Redeemer throughout 2018. Whether you have served in ministry, supported Redeemer financially, or have prayerfully lifted up our church, we thank you for your love and support. God continues to grow His church, fund ministry through our church planting partnership with Acts 29, and fund ministry on our own campus. It is an incredible privilege to meet new people from across the desert each and every week, and they now call Redeemer Church their home. Throughout the past year, God continues to bless us with incredible growth. Redeemer Church has increased in attendance over last year with an average of 9% a week. Because of your generosity we have had the privilege of adding Patrick O’Rourke as our Groups Minister and we have seen Community Groups continue to grow under his leadership. We now have 16 community groups and have added six new groups since September. These groups have added 90 new group members! In addition, Pastor Nate has kicked-off a new Equipping Certificate program, and with two classes now complete, we have averaged 80 attenders growing in knowledge of God and His Word! Redeemer has continued a fruitful relationship with the Acts 29 Church Planting network. A portion of your giving goes to plant churches in the western United States. Currently, 119 churches are a part of Acts 29 West, with these churches partnering to fund 14 church plants. In addition, Acts 29 has blessed the staff of Redeemer with resources through their annual conference! It has been five years since the Building a Legacy vision was cast. Our first major undertaking was to eliminate $655,000 in debt. Early this year, we approached the last $100,000 of principal along with a vision to partner with the Victor Valley Rescue Mission in funding a mobile shower unit for $15,000. We accomplished this goal in about one month’s time! Redeemer Church is now debt free and is poised for future growth with your continued generosity toward the Building a Legacy Initiative. Moreover, the mobile shower unit has been delivered to the Victor Valley Rescue Mission and we have a goal to launch showers for the needy in Apple Valley in early 2019. We are overjoyed to serve alongside each of you and to personally witness the ways that God is transforming the High Desert through Redeemer Church. We desire to impact the Valley through the power of the Gospel for years to come and with your generous gift of time, financial resources, prayer and God’s grace we will continue to see lives transformed through the message of Jesus Christ. We hope and pray that you have the same joy that the Redeemer Church staff has in seeing God at work. If you wish to make an end of year, tax deductible donation to Redeemer you can do so in our weekly worship gathering, online at redeemerhd.com/giving or text-to-give to 760.691.2127.